Stucco or render is a material made of aggregates, a binder, and water. Stucco is applied wet and hardens to a very dense solid. It is used as a decorative coating for walls and ceilings, and as a sculptural and artistic material in architecture. Stucco may be used to cover less visually appealing construction materials, such as metal, concrete, cinder block, or clay brick and adobe. In English, "stucco" usually refers to a coating for the outside of a building and "plaster" to a coating for interiors; as described below, the material itself is often little different. However, other European languages, notably including Italian, do not have the same distinction; stucco means plaster in Italian and serves for both. This has led to English often using "stucco" for interior decorative plasterwork in relief. The difference in nomenclature between stucco, plaster, and mortar is based more on use than composition. Until the latter part of the nineteenth century, it was common that plaster, which was used inside a building, and stucco, which was used outside, would consist of the same primary materials: lime and sand (which are also used in mortar). Animal or plant fibers were often added for additional strength. In the latter nineteenth century, Portland cement was added with increasing frequency in an attempt to improve the durability of stucco. At the same time, traditional lime plasters were being replaced by gypsum plaster. Traditional stucco is made of lime, sand, and water. Modern stucco is made of Portland cement, sand, and water. Lime is added to increase the permeability and workability of modern stucco. Sometimes additives such as acrylics and glass fibers are added to improve the structural properties of the stucco. This is usually done with what is considered a one-coat stucco system, as opposed to the traditional three-coat method. Lime stucco is a relatively hard material that can be broken or chipped by hand without too much difficulty. The lime itself is usually white; color comes from the aggregate or any added pigments. Lime stucco has the property of being self-healing to a limited degree because of the slight water solubility of lime (which in solution can be deposited in cracks, where it solidifies). Portland cement stucco is very hard and brittle and can easily crack if the base on which it is applied is not stable. Typically its color was gray, from the innate color of most Portland cement, but white Portland cement is also used. Today's stucco manufacturers offer a very wide range of colors that can be mixed integrally in the finish coat. Other materials such as stone and glass chips are sometimes "dashed" onto the finish coat before drying, with the finished product commonly known as "rock dash", "pebble dash", or also as roughcast if the stones are incorporated directly into the stucco, used mainly from the early 20th through the early 21st Century. As a building material, stucco is a durable, attractive, and weather-resistant wall covering. It was traditionally used as both an interior and exterior finish applied in one or two thin layers directly over a solid masonry, brick, or stone surface. The finish coat usually contained an integral color and was typically textured for appearance. A stucco face from the ancient Greek city of Ai Khanoum, Afghanistan, 3rd-2nd century BC. 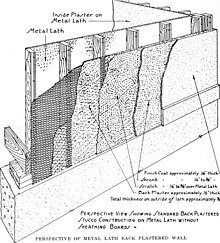 Then with the introduction and development of heavy timber and light wood-framed construction methods, stucco was adapted for this new use by adding a reinforcement lattice, or lath, attached to and spanning between the structural supports and by increasing the thickness and number of layers of the total system. The lath added support for the wet plaster and tensile strength to the brittle, cured stucco; while the increased thickness and number of layers helped control cracking. The traditional application of stucco and lath occurs in three coats — the scratch coat, the brown coat and the finish coat. The two base coats of plaster are either hand-applied or machine sprayed. The finish coat can be troweled smooth, hand-textured, floated to a sand finish or sprayed. Originally the lath material was strips of wood installed horizontally on the wall, with spaces between, that would support the wet plaster until it cured. This lath and plaster technique became widely used. In exterior wall applications, the lath is installed over a weather-resistant asphalt-impregnated felt or paper sheet that protects the framing from the moisture that can pass through the porous stucco. Following World War II, the introduction of metal wire mesh, or netting, replaced the use of wood lath. Galvanizing the wire made it corrosion resistant and suitable for exterior wall applications. At the beginning of the 21st century, this "traditional" method of wire mesh lath and three coats of exterior plaster is still widely used. In some parts of the United States (California, Nevada, Arizona, New Mexico and Florida), stucco is the predominant exterior for both residential and commercial construction. Stucco has also been used as a sculptural and artistic material. Stucco relief was used in the architectural decoration schemes of many ancient cultures. Examples of Egyptian, Minoan, and Etruscan stucco reliefs remain extant. In the art of Mesopotamia and ancient Persian art there was a widespread tradition of figurative and ornamental internal stucco reliefs, which continued into Islamic art, for example in Abbasid Samarra, now using geometrical and plant-based ornament. As the arabesque reached its full maturity, carved stucco remained a very common medium for decoration and calligraphic inscriptions. Indian architecture used stucco as a material for sculpture in an architectural context. It is rare in the countryside. In Roman art of the late Republic and early Empire, stucco was used extensively for the decoration of vaults. Though marble was the preferred sculptural medium in most regards, stucco was better for use in vaults because it was lighter and better suited to adapt to the curvature of the ceiling. 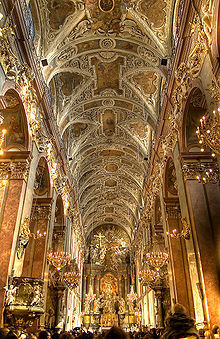 Baroque and Rococo architecture makes heavy use of stucco. Examples can be found in churches and palaces, where stucco is mostly used to provide a smooth, decorative transition from walls to ceiling, decorating and giving measure to ceiling surfaces. Stucco is an integral part of the art of belcomposto, the Baroque concept that integrates the three classic arts, architecture, sculpture, and painting. Since stucco can be used for decoration as well as for figurative representation, it provides an ideal transitive link from architectural details to wall paintings such as the typically Baroque trompe l'oeil ceilings, as in the work of the Wessobrunner School. Here, the real architecture of the church is visually extended into a heavenly architecture with a depiction of Christ, the Virgin Mary or the Last Judgment at the center. Stucco is used to form a semi-plastic extension of the real architecture that merges into the painted architecture. Because of its "aristocratic" appearance, Baroque-looking stucco decoration was used frequently in upper-class apartments of the 19th and early 20th century. Beginning in the 1920s, stucco, especially in its Neo-Renaissance and Neo-Baroque materialization, became increasingly unpopular with modern architects in some countries, resulting not only in new buildings without stucco but also in a widespread movement [de] to remove the stucco from existing tenements. Stucco was still employed in the 1950s in molded forms for decorating the joints between walls and ceilings inside houses. It was generally painted the same color as the ceiling and used in designs where a picture rail or rat rail was in use. Modern stucco is used as an exterior cement plaster wall covering. It is usually a mix of sand, Portland cement, lime and water, but may also consist of a proprietary mix of additives including fibers and synthetic acrylics that add strength and flexibility. Modern synthetic stucco can be applied as one base layer and a finish layer, which is thinner and faster to apply, compared to the traditional application of three-coat stucco. As with any cement-based material, stucco must be reinforced to resist movement cracking. Plastic or wire mesh lath, attached with nails or screws to the structural framing, is embedded into the base coat to provide stiffening for the stucco. One method often used to help conceal the smaller surface cracks that may appear is the application of one of a variety of pre-mixed acrylic finishes. Flexible acrylic finishes have the ability to stretch and bridge over cracks, improving appearance and limiting the passage of moisture behind the stucco. Where stucco is to be applied to a structure of wood-framing or light-gauge steel framing, the framing is protected from moisture damage by applying a cement based primer, or a vapor-permeable, water-resistant weather barrier; typically an asphalt-saturated paper or one of a variety of manufactured plastic-based sheets, known as "building wraps" or "stucco wraps". The properties of the weather barrier must not only protect the framing from rain and moisture, but at the same time allow the free passage of any water vapor generated inside the building to escape through the wall. A wide variety of stucco accessories, such as weep screeds, control and expansion joints, corner-aids and architectural reveals are sometimes also incorporated into the lath. Wire lath is used to give the plaster something to attach to and to add strength. Types include expanded-metal lath, woven-wire lath, and welded-wire lath. The first layer of plaster is called a "scratch coat," consisting of plastic cement and sand. A trowel is used to scratch the surface horizontally or in a crisscross pattern to provide a key for the second layer. A brush is not used because it will cause delamination. The first coat is allowed to dry (cure) before the second layer is applied. The next layer is called the "brown coat" or leveling coat. It also consists of sand, cement, and lime. It is leveled with tools called "darbies", "rods", and "feathereges", scraped smooth, and floated to provide a smooth, even surface onto which the finish coat is applied. It is then allowed to dry (cure) for 7–10 days minimum to allow "checking" (shrinkage) and cracking to take place. If applied during very dry weather, the layers of stucco are sprayed with water for one or more days to keep a level of moisture within the stucco while it cures, a process known as "moist curing." If the stucco dries too soon, the chemical hardening ("hydration") will be incomplete, resulting in a weaker and brittler stucco. Acrylic Finish, an acrylic-based finish from 1 to 4 mm (0.039 to 0.157 in) thick. It can be applied in many ways and can be ordered in any color. Color Coat, a colored sand, cement, and lime mixed finish typically 3 mm (0.12 in) thick. It is applied over the second coat (brown coat) and can be floated with water for a sandy finish or textured over with a trowel to create various styles of finishes. Premixed, bagged stucco is gaining in use and is available in coarse graded sand and finer graded sand for creating a variety of troweled finishes; it is available in a variety of colors. Damaged stucco that has begun to delaminate from its masonry substrate. The repair of historic stucco should begin by identifying the cause of the damage to the stucco finish. Historically, the application of stucco was quite similar to the process of applying lime plaster. Repairs should be carried out as soon as problems become visible, as the damage will only become worse over time. 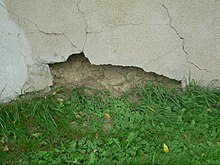 Cracks may form in the stucco due to building settling or direct damage to the exterior coating. Once water is able to breach the coating, whether through an opening in the stucco itself or from beneath its surface, fragile stucco can begin to buckle and crumble. Wood is a common structural material that is often used as substrate beneath stucco. It can absorb moisture from at or below ground level and draw it away from the original source of the problem. Stucco can also be applied to masonry such as brick or stone, which can also be damaged by moisture infiltration. Rising damp from groundwater or drainage issues is especially problematic. The stucco can delaminate from damp wood lath beneath and as the wood rots, the stucco may begin to deteriorate and separate from it and the building. Damage to the stucco itself leads to further moisture infiltration that exacerbates the deterioration of the finish as well as the substrate. Downspouts, gutters, flashing and other means of managing directing water away from the building will prevent damage from getting worse. Without proper guttering, water may splash up onto stuccoed surfaces, staining and accelerating the deterioration of the finish. Grading of the soil around the building may also be necessary to redirect moisture away from the structure and foundation. Depending on the extent of the damage to the finish, varying degrees of repairs may be carried out. Small hairline cracks may be sealed with an additional layer of finish coat or even simply a coat of paint. Modern caulking materials are not ideal mediums of repair. Making the choice to patch or completely repair a stuccoed surface depends on the texture of the finish coat. Repairs, especially numerous ones, made to a smoothly finished surface will be more noticeable and recovering the entire surface with a new layer of finish coat may be more appropriate. Conversely, it may be easier to conceal patches of repair work to a textured surface and complete refinishing may not be necessary. Preparation should begin with the removal of all damaged material in the area to be repaired. Any stucco that is loose should be removed as it has already failed. The removal of compromised materials may extend to wood lath or other substrates that may have also have been damaged, although it may be preferable to install new mesh over damaged lath. Care must be taken regarding this approach, as it may be especially critical when authenticity is of a concern regarding a historic building. In such cases, replacement of damaged lath is generally considered to be more appropriate than installing new mesh. All surfaces should be cleaned to remove paint, oil, or plant growth. Stone or brick mortar joints may be scored to a depth of 5/8" to allow for the proper adhesion of the new stucco. New stucco patches should not overlap old stucco. Diagram showing the use of wire mesh as a substrate for an exterior application of Portland cement. The application of new stucco should not include wire mesh when lime stucco is being repaired on a masonry surface. The new stucco repair should bond to the masonry substrate appropriately without mesh. The introduction of wire mesh has the potential to hasten deterioration of both the masonry and the stucco finish as the slightest amount of moisture will lead to rust developing on the wire mesh, which expands as it rusts. This may lead to the spalling of not only the new stucco, but also of the masonry itself. Preparing for the repair process requires testing to determine the composition of the stucco that is to be repaired. Due to numerous factors, including regionally available materials and original workmanship, there is a variety of materials that may have been used for the original application of stucco. It must also be determined if the type of stucco used is lime-based or Portland cement-based. Of particular concern is the use of Portland cement, which is harder than previous methods used in stucco application. This material is not compatible with softer and more flexible lime cement that was used in the 18th and into the mid-19th centuries. Test sampling is critical to determine the best mixture, in terms of durability, compatibility, texture and color to use in the repair process. Test patches should be used to help make this determination. The same number of layers should be used in the repair as were used in the original stucco application. A professional plasterer or contractor familiar with the process of making repairs to historic stucco should carry out necessary repairs. Typically, a homeowner should not attempt to repair stucco finishes on their own. Further research that should be conducted prior to the commencement of repair includes determining the types of ingredients used in the original stucco so that the color and texture of the original material can be matched as closely as possible. In some cases, shells or pebbles were used in the stucco covering. Regionally sourced sand, for example, may have been used in the original application, but may no longer be readily available. In this way, stucco tended to be tinted directly, although sometimes it was painted after being applied. Additionally, the use of ingredients such as animal hair was popular in some regions. Care should be taken that repairs made include similar ingredients that are clean and free of oils. This is another reason for the use of test patches, to ensure that the repairs blend into the original building fabric as much as possible. ^ Henry, Alison; Stewart, John, eds. (2011). Practical building conservation. Mortars, plasters and renders. Farnham/Burlington: Ashgate Publishing. p. 87. ^ "The saint city Częstochowa - the merina for Faithfulls". www.kopernik.czest.pl. Archived from the original on October 13, 2007. Retrieved March 12, 2009. ^ "Stucco Mixture". Sto Supply. Retrieved November 15, 2010. ^ a b c d e f "Preservation Brief 22: The Preservation and Repair of Historic Stucco". www.nps.gov. Retrieved 2017-12-03. ^ "Common Stucco Issues | Murtagh Construction PA". 2016-01-27. Retrieved 2017-12-03. ^ "How to Repair Stucco". 2007-06-05. Retrieved 2017-12-03. ^ "Repairing Stucco". Old House Restoration, Products & Decorating. Retrieved 2017-12-03. ^ "Exterior Stucco". www.buildingconservation.com. Retrieved 2017-12-03. Grimmer, Anne Grimmer. The Preservation and Repair of Historic Stucco. Technical Preservation Services, Heritage Preservation Services Division, National Park Service. Wadsworth, Emily (1924). "Stucco Reliefs of the First and Second Centuries still Extant in Rome". Memoirs of the American Academy in Rome (4): 9–102.